During the race there was plenty of action on the water with a couple of capsizes, some interesting bare aways at the top mark and some minor breakages in the strong conditions. 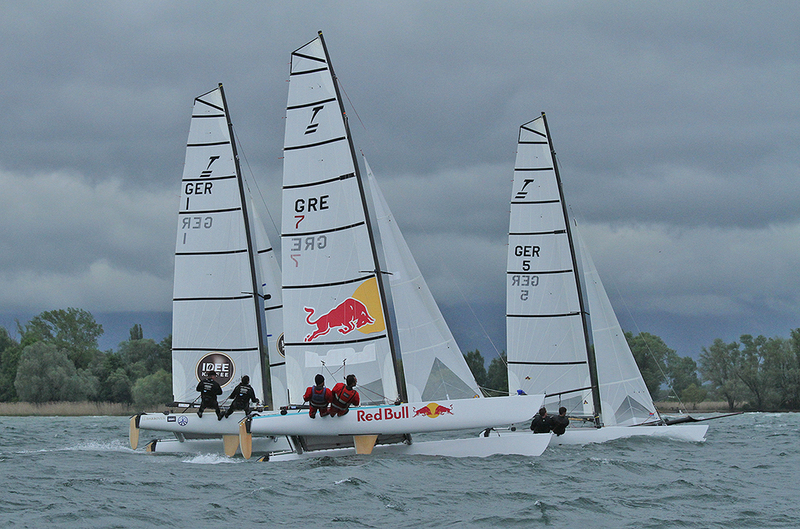 The second race was started in the same conditions with only 15 boats starting the race and 11 finishing. 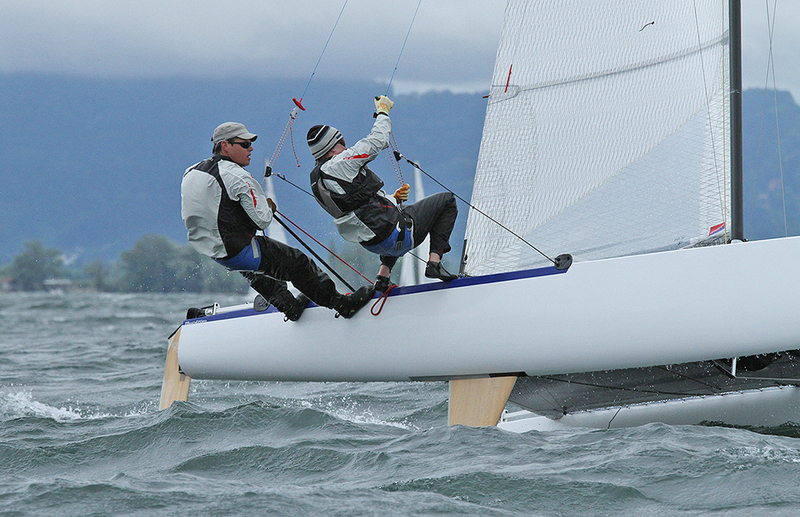 Again the strong wind specialists Iordanis and Kostas took the victory followed by Roland and Nahid, then the Swiss pairing of Marcel and Jorg Steiner. A consistent series puts them into 6th place moving into the last day of racing. The fleet were then sent back into shore to wait and see what the wind did. The race officer decided to delay for 1 hour 30 minutes, after that period at 2pm the wind had died off to nothing with the sailors left waiting. At 5pm the race officer took the postponement flag down and the fleet were back out onto the water for more racing. It was like another location from the mornings sailing, beautiful sunshine and around 6 knots of breeze. The boats were then drifting back to shore less than 30 minutes later because the wind had disappeared. 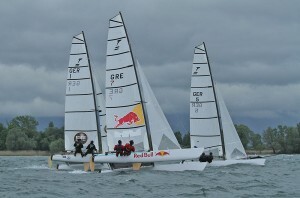 An interesting and varied day of racing for the competitors of the European Championships. Further down the fleet 20 points separate 7th and 11th place and the rest of the fleet spread out below that in the table. In 12th place are Sepp and David Gunkel who are sailing the Gold Medal winning boat from Beijing. Below them in 13th are the Australian pairing of Allan Gamble and Damien McAlinden. There is a local battle between 19th and 20th place with Dietmar having the advantage over Roland by one point leading into the last day. The race for 1st place is currently lead by The Gaeblers who lead the Greek Red Bull team by 3 points. 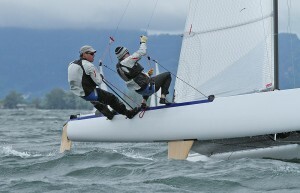 Roland and Nahid will be hoping for a light wind day to knock the Greeks off the podium they’ve held since 2008.